The first thing to remember, is that the pellet cookers do NOT display the exact temperature in the cooker, but rather, display a 90 second running average of the temperature over time. So considering this, the controller display may never exactly match what an external probe displays. If the lid is left closed, no meat is in the cooker, and you are just reading temperatures, the longer the cooker is allowed to normalize, the closer the controller temperature will be to an external probe. Also, the controller temperature that is displayed is programmatically calculated to approximate the center of the lower cooking grates. 1. Verify your external probes in boiling water. This will allow you to see if the probes are correct or how many degrees they are off of 212 degrees. 2. Never run external probes through the cooker door. Use a probe port or the chimney. Running probes through the door disrupts the positive airflow in the cooker and will cause temp fluctuations. 3. Place the external probe directly on the cooking grate (not in a holder), just to the left of center of the lower cooking grates, with the tip centered front to back. The is the approximation point for the controller when calculating the displayed temperature. 4. Never place anything within 6" of the probe. The cold mass close to a temperature probe WILL affect the probe and cause erroneous temperature readings. 5. Never open the cooker's lid when verifying temperatures. This will collapse the cooking environment, and cause a temperature loss which will require a recovery period. 6. Remove all foil, pans and trays from the cooker when verifying temperatures. Foil, pans and trays in the cooker WILL affect the temperature readings. 1. It is a requirement that each cooking session start with plugging the cooker into power. If the cooker is already plugged into power, it MUST be unplugged for a minimum of 30 seconds and then plugged back into power, before starting a cooking session. This resets the controller, like a cold boot for a computer. 2. It is a requirement that the burn grate fitment in the firebox be checked prior to each cooking session. 3. It is a requirement that the silicone seals around the firebox be checked and maintained (see manual reference in #2). This insures the proper function of the air delivery through the burn grate and insures an efficient fire. 4. It is a requirement that all ash be cleaned from the burn grate and firebox prior to each cooking session. 5. It is a requirement that the chimney be mounted flush with the inside wall of the cooker. This allows proper scavenging of the heat and smoke from the cooking environment. 6. It is a requirement that the heat diffuser plate be centered front to back on the hopper end of the cooker. This allows for the even distribution of heat and smoke into the cooking chamber. -Excessive opening of the cooker lid during cooking. Each time the lid is opened, the cooking environment is collapsed, and requires a recovery period. -Warped heat Diffuser plate: http://community.yodersmokers.com/viewtopic.php?f=36&t=338. -Spritzing/spraying/mopping liquid into the cooking environment during cooking. This causes an evaporative cooling effect in the cooker which lowers temperatures and requires recovery time. 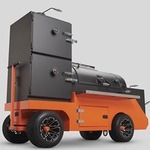 -Air flow from the cooker's fans:http://community.yodersmokers.com/viewtopic.php?f=36&t=354. The Yoder factory uses BBQR's Delight for all testing and calibration. Pellet bags are NOT moisture proof. NEVER store pellets directly on the floor. Pellets normally contain less than 10% moisture, and will absorb moisture from the air in an attempt to normalize with the moisture content of the environment they are stored in. Thanks for this detailed report Herb. A pellet grill makes easy work out of barbecue, but it can also increase blood pressure if you worry too much about the display temp.